RMON Networks Owners Tim and Denise Howard cut the ceremonial ribbon|! !| along with their team members|! !| to celebrate 15 years of business. 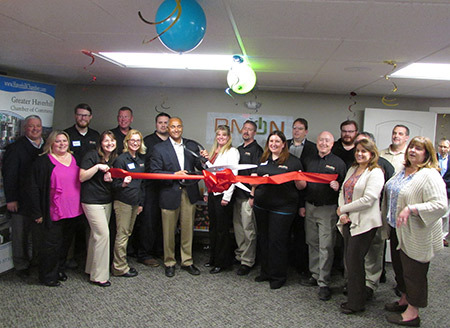 Earlier this month, the Greater Salem Chamber and Greater Haverhill Chamber helped RMON Networks celebrate 15 years of business with a ribbon cutting ceremony and Multi-Chamber Mixer. RMON Networks is a provider of IT services and solutions for small to mid-sized organizations, located in Plaistow. The NH High Tech Council will kick-off the re-launch of the BioTech/MedTech Cluster on Thursday, May 18. The BT/MT Cluster is engaging with stakeholders to create an industry-led initiative that highlights and focuses on BioTech/MedTech specific concerns and opportunities, including bringing resources to the forefront, focusing on filling the workforce pipeline, and showing the dynamic BioTech/MedTech industry in New Hampshire. More information can be found here. Alpha Loft will hold its Startup Shindig the evening of Tuesday, May 23 at Dyn/Oracle's offices in the Manchester Millyard. The event will showcase the startups participating in Alpha Loft's Accelerate NH program, which will compete for a total of $300,000 in funding. John Considine, general manager of Cloud Infrastructure Services at IBM, will be the featured speaker. Click here for tickets. Netria Corporation, an Exeter-based seller of current or discontinued IT products, has promoted Sarah Chesbrough to vice president of operations and John Peffer to vice presidents of sales. Chesborough stated at Netria in 2003 and has progressed through a variety of roles in the company with increased responsibility. Peffer joined Netria in 2010 as sales manager and has been instrumental in expanding the sales organization and customer penetration. Attorney Bill Loginov, founder and principal of Loginov IP,​ is among a line-up of "World Class" speakers and presenters featured at the Dartmouth Entrepreneurs Forum at the Tuck School of Business at Dartmouth in Hanover on Friday, May 12th. The Dartmouth Entrepreneurs Forum is a bi-annual, coast to coast conference and startup competition. This year’s Hanover conference includes a line-up of industry expert guest speakers, presenters and panel discussions with keynote speaker Gail Goodman, former CEO of Constant Contact. Click here for more info.